“The Mountain and the Valley is an affectionate portrait of David Canaan, a sensitive boy who becomes increasingly aware of the difference that sets him apart from his family and his neighbours. David’s desire to write is the secret that gives this haunting story its detailed focus and its poignant theme. 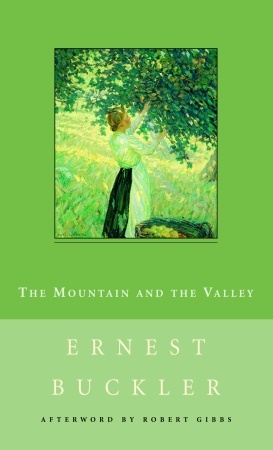 This was an unusual book for me–I really liked parts of it and really disliked other parts–real mountain and valley stuff. Sometimes the writing seemed self-conscious and was a bit of a turn off and then other times it was absolutely brilliant. I didn’t particularly like David. He was really selfish and snobbish & disrespectful toward his family. I get that he was a bit of a square peg in a round hole, but at least when his family members did something that made him feel bad, they didn’t do it on purpose. I really enjoyed the parts about his parents–at times I wished the book had been about them instead of David, and his descriptions of the seasons and of Christmas were great too. I’m glad I read the book due to having read those passages alone (I mean it was worth it just to have read them, even if there had been no other good parts–and there were of course). It really did seem like a Canadian Portrait of the Artist as a Young Man.